Hendrickson Software Development’s Purify 2.1.8 is a unique application—it’s neither an in-app spam filter (as are Personal AntiSpam [ ] and SpamSieve [ ]), nor is it a standalone spam filter (like SpamSweep and SpamX). Purify is a so-called pass-through spam filter that scans and categorizes your e-mail as it arrives—it doesn’t actually trap or block spam, but codes it so that you can then handle it as you wish with your e-mail client of choice. As you’ll see, this approach has both advantages and disadvantages when compared to in-app or standalone spam filters. On the downside, it is still a separate application, so you’ll occasionally have to work in two programs to manage your e-mail and spam filters. Purify is a cross-platform application written in Java, as is SpamX. 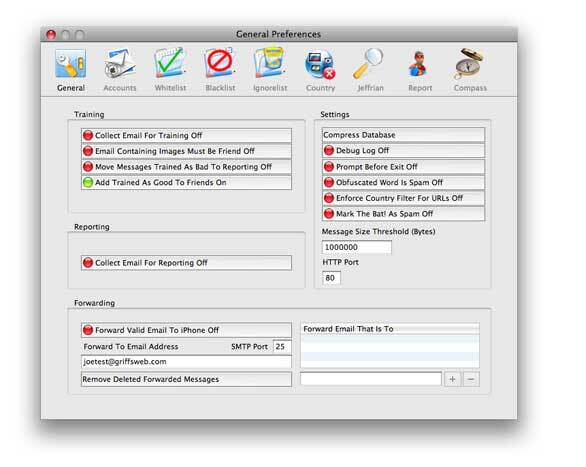 Unlike SpamX, however, the interface in Purify is usable and reasonably Mac-like, though there are occasional spots of oddness—there’s a dialog that appears when you train messages as spam or ham, for instance, that says simply OK, but has both OK and Cancel buttons. To get Purify running, you start on the General tab of Purify’s preferences screen. This screen looks quite intimidating, as it’s loaded with options, and the button style used is not Mac-standard. However, you can leave most of the settings unchanged, and the manual does a reasonable, though not great, job of explaining what each option controls. The Accounts tab is where you’ll do the real setup work. Here you enter your e-mail account information, basically as you would in Mail ( ) or Entourage ( )—address, name, and POP/IMAP server information. You also need to specify a local port for Purify to use when talking to your e-mail client, along with a filtering key that comes when you purchase Purify. Other tabs in the preferences screen give you direct access to the following features: Whitelist (where you can import Address Book entries with a couple of mouse clicks), Blacklist, Ignorelist (useful for ignoring responses from abuse reporting sites if you report spam), Country (to block e-mail from certain countries), Jeffrian (the Bayesian filter; the developer’s name is Jeff), Report (to report spammers to their ISPs), and Compass (a separate application to archive e-mail). Purify offers a wealth of configuration options, enough so that this screen looks intimidating. Most options can be left as is, and the manual explains the function of each, so it’s not as bad as it looks. You can customize each of these areas to meet your needs, though you may find the process intimidating—the manual points out you’ll get the most power from these filters if you know how to use regular expressions, which aren’t the simplest things to understand. After setting up Purify, you then need to set up your e-mail program—instead of connecting to the internet, your e-mail client will instead connect to Purify, using the port you assigned to each account within Purify. While this sounds intimidating, it’s not too hard, and you only have to change two or three settings within each account. Once both Purify and your e-mail client are set up, the last step is to create a rule (or rules) to handle messages that Purify marks as spam. Purify adds two new header fields to every message; the values in these header fields are then used in the rules to process your spam (and ham, if you wish) message. The X-Purify-Rating header will contain either SPAM or HAM (a good message), and the X-Purify-Reason header will show the reason why each message was rated as ham or spam. The manual walks you through setting up a spam filtering rule for Mail, but you’re on your own for Entourage and other programs. The basic setup is pretty straightforward, however—just check if the X-Purify-Rating header contains SPAM, and if it does, add whatever processing rules you’d like to use on that piece of spam. Once I had everything set up, Purify worked quite well. It correctly identified spam and ham very accurately, and I liked not having to worry about timing issues on checking mail, even though Purify is a standalone application. Using the provided AppleScripts, I was able to train Purify for those few messages it didn’t correctly identify. Checking e-mail did take slightly longer than when going directly to the ISP, but not to the point of being an annoyance. If you like statistics, you’ll be disappointed in the lack of data available from Purify—you can’t see summary statistics for messages identified as spam, ham, false positives, etc. Purify 2.1.8 worked well as a pass-through spam filter. By acting as a pass-through, timing issues are avoided, and all e-mail will be filtered. Setup, however, is complicated, and getting the most out of the program requires knowledge (regular expressions) that not all users will have. Users will also have to set up their own spam processing rules in their e-mail client, which is something not everyone will want to do. If you have a technical background, and want the flexibility that comes from a pass-through spam program with a lot of customizable features, Purify is a good option. It’s also a good option if you’re in a multi-platform environment, as it runs on all the major operating systems. However, those looking for an integrated solution—meaning most end-users—will be better served by SpamSieve or Personal AntiSpam. Both get the job done with less up-front configuration and fully integrate with the major OS X mail clients.